Every new drug formulation, testing phase, and government approval means longer, healthier lives. However, new medicines also bring new problems and the possibility of exacerbating old ones. Aging and medication go hand in hand, but how much do you really know about your prescriptions? Adults age 65 and older buy 30% of all prescription drugs and 40% of all OTC medications. 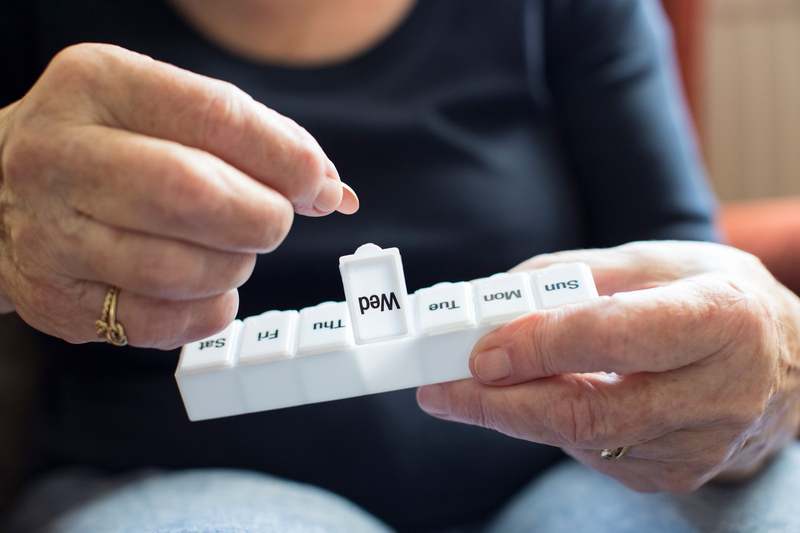 One in six seniors will suffer an adverse reaction to their medications. Falls are the leading cause of death among the elderly, and many of those falls are related to a drug overdose, missed doses, and adverse drug interactions. Prescription drug abuse is found in about 30% of those between the ages of 65 and 85. Polypharmacy, “defined as the use of multiple drugs or more than are medically necessary, is a growing concern for older adults” and increases the chance of death in the elderly. 90% of the aging population faces a higher risk of Alzheimer’s, dementia, stroke, high blood pressure, high cholesterol, and diabetes. However bad the statistics, adding new drugs without careful consideration increases both the chances of bad reactions and abuse. What do you need to know about aging and medication? The best way to ensure that you or your loved one are getting the right treatments is to ask questions. Educate yourself! Do you know the possible side effects of your heart medication? Do you understand why you should always take a certain pill on an empty stomach? Are your prescriptions compatible? These questions can help you avoid hazards and enjoy the benefits of your medications. Not sure how to approach your doctor with these questions? Consider a three-way conversation between the patient, the doctor, and a health advocate. The advocate is a friend, relative or healthcare professional who serves as a listener, note-taker (see our blog post “Don’t Worry: I’ll Take Notes For You“), and information seeker. Together, go over which doctors are prescribing which drugs as well as the dosages, side effects, and things to avoid. You should also discuss OTC products such as vitamins and herbal supplements. Additionally, review the patient’s daily routine and health, as well as any physical or cognitive changes. Medications interact with other medications and alcohol as well as certain foods. These interactions cause prescriptions to work differently or stop working altogether. Age also changes how drugs work; the aging body has less muscle to absorb medication, so dosage adjustments are sometimes necessary to prevent side effects. Ask your doctor to cover drug interactions for each new prescription you receive. Depending on the type of medication and the person’s condition, missed doses of certain medications can result in rapid and serious illness. Time-released drugs, drugs requiring food, and drugs for diabetes, heart disease, high blood pressure, seizure disorders and cancer treatments are critical. Trying to make up a missed dose by doubling it can result in a trip to the emergency room. There are smartphone reminder apps, charts and calendar reminders available, and for the forgetful, there are smart pill bottles. Our agency’s 33 years of experienced care is reflected in every nurse and administrator on our team. For more information about David York Agency’s qualified, compassionate caregivers, please contact us at 718.376.7755. If you’d like to hear more from us, please like us on Facebook or follow us on Twitter, Google+, or LinkedIn.